Red-tailed Hawk: John Purves Photo. The Tuesday bird walk went to the Plummer Road side of the Englishman River Estuary in Parksville. The morning was sunny and warm with calm winds off the Strait of Georgia. Large numbers of Pine Siskins were with us throughout the morning. 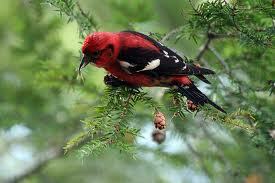 We saw huge flocks of Red Crossbills in the forest and huge rafts of seabirds on the Strait. A Red-tailed Hawk perched close to the trail giving us great views to finish off a perfect morning of birding. A special thanks to John Purves for leading this mornings bird walk! Nineteen birders saw and heard the following fifty-four species. The Tuesday bird walk on April 02 will be going to the Shelly Road side of the Englishman River Estuary in Parksville. 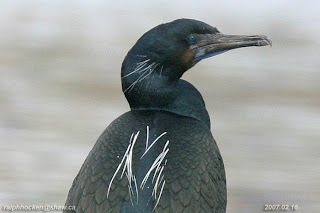 Brandt's Cormorant: Ralph Hocken Photo. The Sunday bird walk went to the Neck Point Park in Nanaimo. The morning was cloudy and there was a strong cold wind coming off the Strait of Georgia. We saw several Double-crested Cormorants, Pelagic Cormorants and Brandt’s Cormorants in breeding plumage--- spring is getting closer! A flock of Yellow-rumped Warblers kept us entertained as they sang and fed on the bushes close to us. We also spotted a flock of Red Crossbills, Ruby-crowned Kinglets and Golden-crowned Kinglets all feeding in the same area. Canada Geese, Mallard, Double-crested Cormorant, Pelagic Cormorant, Brandt’s Cormorant, Bufflehead, Surf Scoter, Common Goldeneye, Barrow’s Goldeneye, Harlequin Duck, Red-breasted Merganser, Common Merganser, Horned Grebe, Black Turnstones, Black Oystercatcher, Bald Eagle, Mew Gulls, Thayer's Gull, California Gull, Glaucous-winged Gull, Pigeon Guillemot, Marbled Murrelet, Common Murre, Northern Flicker, Pileated Woodpecker, Common Raven, Northwestern Crow, European Starling, American Robin, Varied Thrush, Ruby-crowned Kinglet, Golden-crowned Kinglet, Anna’s Hummingbird, Yellow-rumped Warbler ,Red-breasted Nuthatch, Chestnut-backed Chickadee, Brown Creeper, Bushtit, Pacific Wren, Bewick's Wren, Spotted Towhee, Song Sparrow, Pine Siskin, Red-winged Blackbird and Red Crossbill. A pair of American Goldfinch were visiting feeders in the 2500 block of Glenayr Drive in Nanaimo. “Rare Bird Alert- Citrine Wagtail” The Citrine Wagtail was seen once again in Courtenay on March 21. Apparently the land is now being actively farmed and there is no longer any access to the original site/farm lane. The Tuesday bird walk went to Rathtrevor Provincial Park in Parksville. The morning was cloudy with a strong biting cold wind off the Strait of Georgia. Thousands of singing Brant were just offshore at the main beach. Hundreds of Mew Gulls, a number of California Gulls, many Thayer's Gulls, three Herring Gulls and several Glaucous-winged Gulls were along the shoreline. 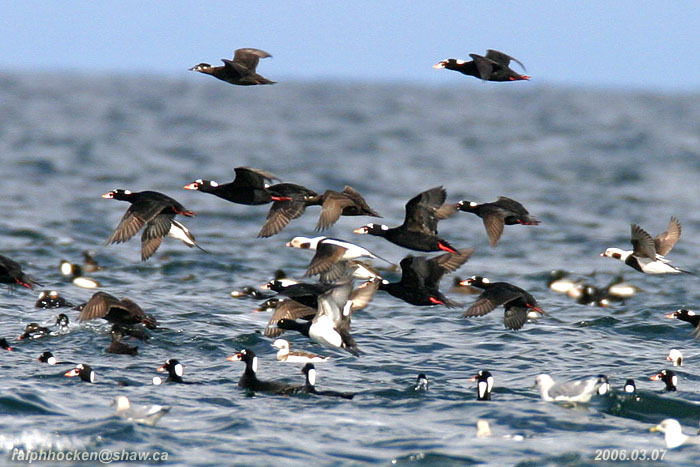 Thousands upon thousands of Surf Scoters, Greater Scaup, Harlequin Ducks, White-winged Scoters, Black Scoters and Long-tailed Ducks formed a huge raft further offshore. We spotted one lone Pigeon Guillemot swimming by itself along the Strait. We had good views of a Brown Creeper climbing a tree, with Golden-crowned Kinglets feeding above the Creeper. A Pacific Wren sang in the forest and gave us good long views. Dark-eyed Junco, Purple Finch and Pine Siskin. The Tuesday bird walk on March 26, 2013 will be going to the Plummer Road side of the Englishman River Estuary in Parksville. We will meet at Parksville Bay at the Lion's Playground parking area in Parksville at 9:00 a.m. or at the corner of Plummer Road and Shorewood Drive at about 9:10 a.m. There will be no Sunday Bird Walk on Easter Sunday, March 31, 2013. Happy Easter! The Sunday Bird Walk on April 07, 2013, will be going to Buttertubs in Nanaimo. We will meet at the bird store at 9:00 a.m. or at the parking lot at Buttertubs off Bowen Road in Nanaimo at about 9:20 A.M. Ducks in flight--Herring Spawn: Ralph Hocken Photo. The Tuesday bird walk on March 26, 2013, will be going to the Plummer Road side of the Englishman River Estuary in Parksville. The Sunday bird walk went to the Little Qualicum River Estuary in Qualicum Beach. The morning was sunny and cool with a strong wind coming off the water. Thousands of gulls greeted us at the start of the walk. We watched a large raft of Harlequin Ducks, Green-winged Teal, Surf Scoters, White-winged Scoters, Black Scoters, Long-tailed Ducks, Bufflehead and Common Goldeneye were further off shore at the viewing platform off of Highway 19A. 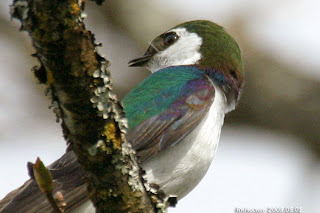 Tree Swallows and Violet-green Swallows were dancing over the river hawking insects. Canada Goose, Brant, Mallard, American Widgeon, Eurasian Widgeon, Northern Pintail, Greater Scaup, Harlequin Duck, Green-winged Teal, Surf Scoter, White-winged Scoter, Black Scoter, Long-tailed Duck, Bufflehead, Common Goldeneye, Common Merganser, Pacific Loon, Common Loon, Horned Grebe, Great Blue Heron, Bald Eagle, Black Turnstone, Black Oystercatcher, Killdeer, Mew Gull, California Gull, Thayer's Gull, Glaucous-winged Gull, Belted Kingfisher, Northern Flicker, Northwestern Crow, Common Raven, Tree Swallow, Violet-green Swallow, American Robin, European Starling, Spotted Towhee, Red-winged Blackbird, Brewer’s Blackbird, House Finch, Song Sparrow, Golden-crowned Sparrow and Dark-eyed Junco. Four Evening Grosbeaks, Tree Swallows and American Goldfinch were seen at the Morningstar Ponds in French Creek. Three Yellow-rumped Warblers were seen at the Morningstar Ponds in French Creek. A Rufous Hummingbird was seen at Shore Drive and Hammond Bay Road in Nanaimo. This is our first report of a returning Rufous Hummingbird. Spring is on its way! the black scapulars of the White-winged Crossbills were very distinctive through our spotting scopes. walks, making a terrific end to a great day of birding!. Platform again today. The Palm Warbler is usually seen east of the Rockies. The Citrine Wagtail was seen once again in Courtenay on March 07. The Tuesday bird walk on March 19, 2013 will be going to Rathtrevor Provincial Park in Parksville..
We will meet at Parksville Bay at the Lion's Playground parking area in Parksville at 9:00 a.m. or at the main parking lot at Rathtrevor Provincial Park at about 9:10 a.m. 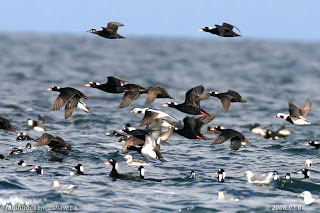 The Sunday Bird Walk on March 24, 2013, will be going to Neck Point in Nanaimo. We will meet at the bird store at 9:00 a.m. or at the parking lot at Neck Point Park off Hammond Bay Road in Nanaimo at about 9:20 A.M.
Yellow-rumped Warbler: John Purves Photo. The Tuesday bird walk went to the Little Qualicum River Estuary in Qualicum Beach. The morning was cloudy and calm. as we saw at the viewing platform earlier in the morning. Over ten Violet-green Swallows flew over head hawking insects and we spotted a Red Crossbill at the top of a bush as we neared the estuary. We caught the sight of four White-winged Crossbills perched on top of a conifer across the Conservation area. The bold white-wing markings and the black scapulars of the White-winged Crossbills were very distinctive through our spotting scopes. The White-wing Crossbills stayed for a long period, giving us all long studying looks. 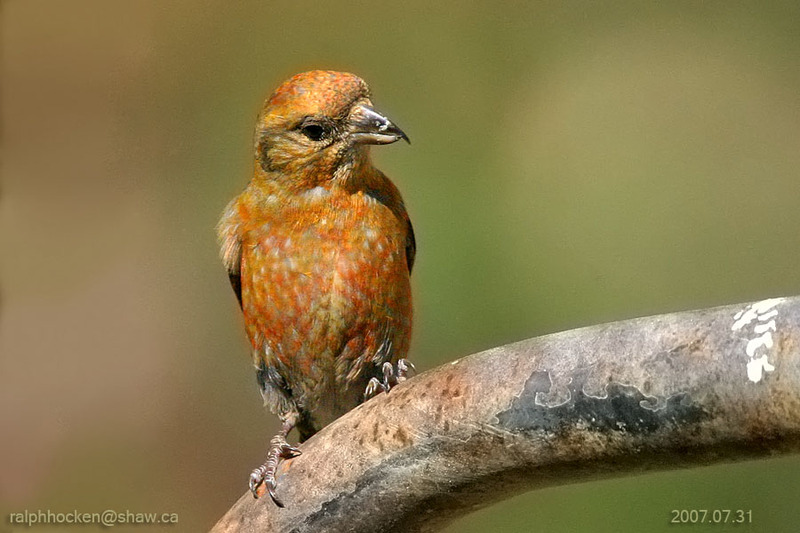 The White-winged Crossbills are normally found in areas outside of southern British Columbia. This is the first sighting of them for the Tuesday bird walks, making a terrific end to a great day of birding! The Tuesday bird walk on March 19, will be going to Rathtrevor Provincial Park in Parksville. 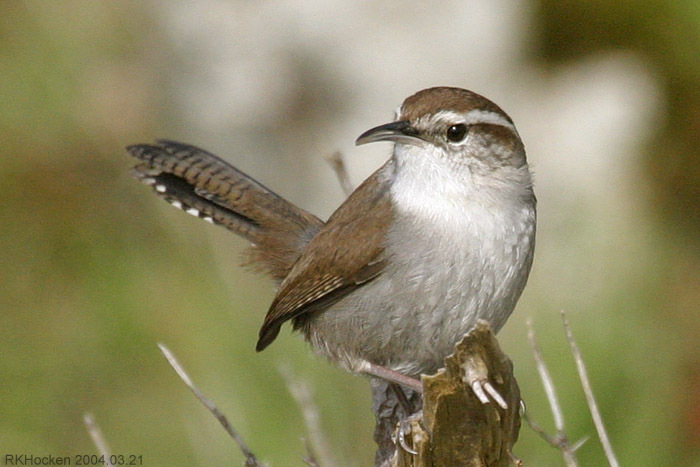 Bewick's Wren: Ralph Hocken photo. cloudy and cool. American Robins, Brown Creeper’s, Red-breasted Nuthatch, Bewick’s and Pacific Wren’s were singing throughout the morning. Mallard, Glaucous-winged Gull, Chestnut-backed Chickadee, Red-breasted Nuthatch, Anna's Hummingbird, Downy Woodpecker, Northern Flicker, Northwestern Crow, Common Raven, Bewick's Wren, Pacific Wren, Golden-crowned Kinglet, Brown Creeper, American Robin, Varied Thrush, Spotted Towhee, Song Sparrow, Pine Siskin and House Sparrow. It was a quiet morning! Three tree Swallows were seen at the Nanaimo River Estuary in south Nanaimo. A flock of over fifty Evening Grosbeaks were seen at Holden Creek in Cedar. A Ruddy Duck and Tree Swallows were seen at Somenos Marsh. A Canvasback was seen at Quammichan Lake and Lesser Scaup, Gadwall and Northern Shoveler were seen at the Sewage Ponds in Duncan. (Courtenay River). Turn right onto Comox Road (Dyke Rd) until the Pumping Station on the right hand side of the road. There is a dirt road across the road with a For Sale sign on the left. Walk up the dirt road towards the steel chain blocking vehicle access. The Wagtail has been observed on the left side of dirt road at the furthest row of trees. A Violet-green Swallow was spotted at Buttertubs Marsh in Nanaimo. A Rufous Hummingbird was reported visiting a feeder at Sealand and Sunset Road in north Nanaimo. A Turkey Vulture was seen above McKeon Road in Harewood Plains in Nanaimo. The Tuesday bird walk went to Columbia Beach. The morning was cloudy and the winds were calm. We were greeted with thousands upon thousands of gulls, huge numbers of sea lions, seals and fishing boats when we arrived.The Herring spawn has begun! We spotted a Eurasian Wigeon and one Brant in with the gulls at the gravel bar. Several flocks of Brant flew over the water. Mew Gulls, California Gulls, a Ring-billed Gull, a Herring Gull,a Western Gull, a Glaucous Gull and a large number of Thayer's Gulls and Glaucous-winged Gulls were seen throughout the morning. Sparrow, Golden-crowned Sparrow, Dark-eyed Junco, House Sparrow. Nanoose Library Hall on NW Bay Road. Admission free. The Tuesday bird walk on March 12, 2013 will be going to the Little Qualicum River Estuary in Qualicum Beach. We will meet at Parksville Bay at the Lion's Playground parking area in Parksville at 9:00 a.m. or at the viewing platform near Garrett Road in Qualicum Beach at about 9:20 a.m. The Sunday Bird Walk on March 10, 2013, will also be going to the Little Qualicum River Estuary in Qualicum Beach. We will meet at the bird store at 9:00 a.m. or at the at viewing platform near Garrett Road in Qualicum Beach at about 9:30 A.M.
CITRINE WAGTAIL - The Citrine Wagtail was behind the alder strip in the cornfield 200m down wagtail avenue Thur March 7th 5.10pm and then flew into trees for 5 minutes then headed to Comox. VIOLET-GREEN SWALLOW - was seen Wednesday March 6 at Buttertubs Marsh. This is the first report of the year for Nanaimo. RUFOUS HUMMINGBIRD - was reported visiting a feeder at Sealand and Sunset road in north Nanaimo. The herring spawn is underway and it has been very activie in the Qualicum Beach and Parksville area. Hammond Bay is a spot to watch for the herring spawn along with all the birds that are attracked by it. 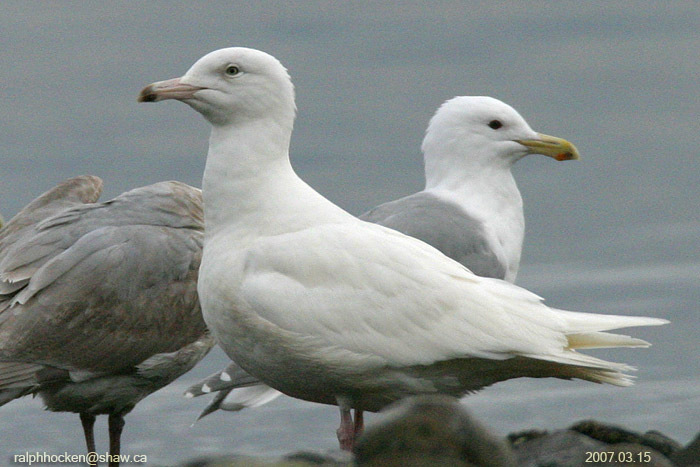 Glaucous Gull, Ralph Hocken Photo. The Tuesday bird walk went to Columbia Beach. The morning was cloudy and the winds were calm. We were greeted with thousands upon thousands of gulls, huge numbers of sea lions, seals and fishing boats when we arrived. The Herring spawn has begun! We spotted a Eurasian Wigeon and one Brant in with the gulls at the gravel bar. Several flocks of Brant flew over the water. Mew Gulls, California Gulls, a Ring-billed Gull, a Herring Gull, a Western Gull, a Glaucous Gull and a large number of Thayer's Gulls and Glaucous-winged Gulls were seen through out the morning. The Tuesday bird walk on March 12 will be going to the Little Qualicum River Estuary in Qualicum Beach. Citrine Wagtail: John Purves Photo. The Citrine Wagtail, Canada's first (and only the second for the ABA Checklist Area), and originally found by David and Adele Routledge, continues in Courtenay was seen again on March 04, 2013. The Wagtail was seen by a birder from Oregon, two birders from Montana, two birders from Parksville and two birders from Nanoose Bay, it was feeding at the far end of the trail near the second row of bushes on the left side of the trail. It was feeding in the mud trail in the field for about one hour then it flew through the bushes and started feeding on the cornfield along the old cornstalks. Palm Warbler: John Purves Photo. 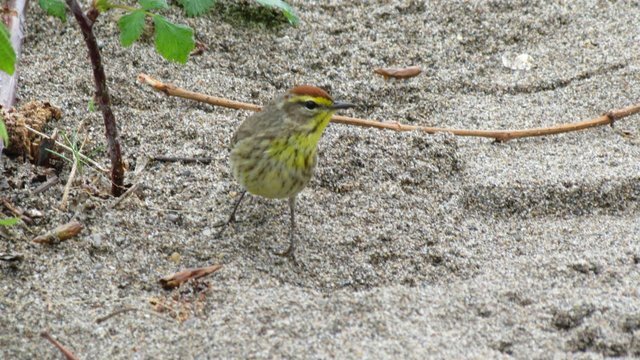 The Palm Warbler was seen on March 04, feeding with Dark-eyed Juncos and Golden-crowned Sparrows near the viewing platform and the hedgerow that runs along the river bank at the Nanaimo River Estuary in south Nanaimo. 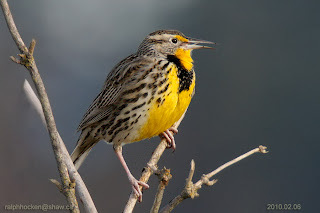 Western Meadowlark: Ralph Hocken Photo. The Sunday bird walk went to the Nanaimo River Estuary in south Nanaimo. The morning was bright and sunny with a strong biting wind. The bird of the morning was a Palm Warbler. The Palm Warbler is a rare bird for this area and it is the first one we have seen on the bird walks. Normally it is seen east of the Rockies. 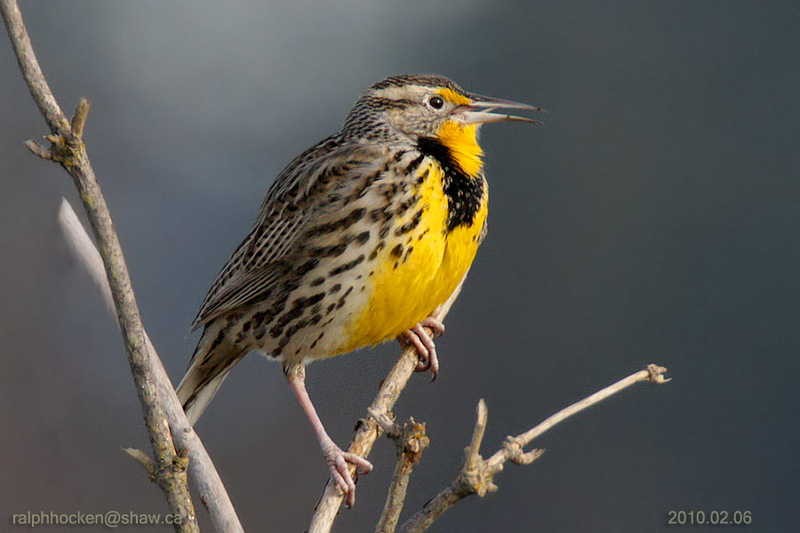 We saw five Western Meadowlarks fly in to a bush giving us great views. A Northern Harrier flew low over the ground looking for prey. We spotted two Northern Shrike at the end of the walk. Trumpeter Swan, Canada Goose, Great Blue Heron, Mallard, Green-winged Teal, Common Merganser, Northern Pintail, Barrow’s Goldeneye, Bald Eagle, Northern Harrier, Red-tailed Hawk, Northern Shrike, Glaucous-winged Gull, Mew Gull, California Gull, Northern Flicker, Palm Warbler, Steller’s Jay, Common Raven, Northwestern Crow, Chestnut-backed Chickadee, Bewick's Wren, Pacific Wren, American Robin, Western Meadowlark, European Starling, Red-winged Blackbird, Spotted Towhee, Song Sparrow, Fox Sparrow, Golden-crowned Sparrow, House Finch and Dark-eyed Junco. The Tuesday bird walk went to the Shelly Road side of the Englishman River Estuary in Parksville. The morning was cloudy with strong biting winds and misty rain at the end of the walk. We saw nine Northern Flickers perched throughout the forest during the morning. A Northern Shrike put in several appearances perching in different locations after chasing prey. We spotted two California Gulls roosting on a sand bar near shore in with a huge number of Mew Gulls, Thayer's Gulls and Glaucous-winged Gulls. Red-winged Blackbird, Brewer’s Blackbird, Pine Siskin and House Finch. The Citrine Wagtail was seen once again in Courtenay on February 26. The Tuesday bird walk on March 05, 2013 will be going to Columbia Beach. We will meet at Parksville Bay at the Lion's Playground parking area in Parksville at 9:00 a.m. or at the parking area off Admiral Tryon Blvd. Turn onto Columbia Drive from Highway 19A in Columbia Beach(on the ocean side of the highway) and then right onto Admiral Tryon Blvd and go for about 100 yards, just past the mail boxes at about 9:20 a.m. The Sunday Bird Walk on March 10, 2013, will be going to Bowen Park in Nanaimo. We will meet at the bird store at 9:00 a.m. or at the parking area off Bowen Road near the Lawn Bowling Green in Nanaimo at about 9:20 A.M.